As we drove toward Mount Moosilauke on New Year’s day, we caught a glimpse of its summit, brilliant white under the high cloud deck, and thought eagerly of our plans to hike to that summit the next day. Lelia and Andy and I hiked in past the Ravine Lodge, finding the going easy on a shallow but firm snow cover, with the last of the deep-pink sunset fading as we reached John Rand cabin. In a couple of hours the cabin was cozy and warm and we welcomed the arrival of friends Jen and Lars. After a wonderful pasta dinner and conversation, we settled in for a cozy first night of the new year; all in all, a great foundation for a big hike the next day. 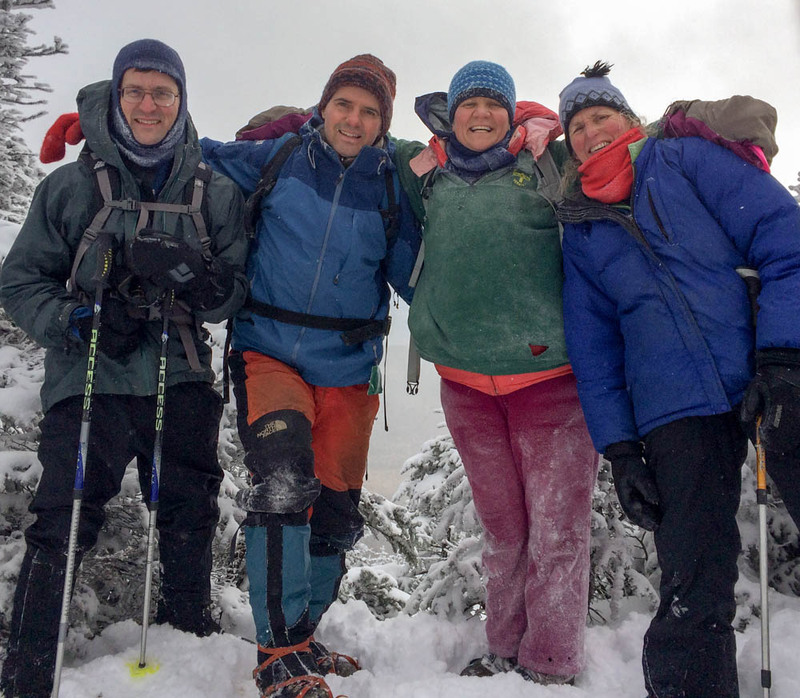 David, Lars, Jen, and Lelia on the trail after visiting the summit.